WELLINGTON, Prince Edward County — We meet at the usual spot (a non-descript parking lot in Ajax) as we transfer our bags and boxes into Rick Bates’ super big pickup truck. We’ve made this trip this before; four guys in search of the very soul and personality that makes Prince Edward County in south-eastern Ontario one of the most rewarding wine destinations in Canada. I’m riding shotgun for the drive to PEC and I find it a challenge to keep Bates focused on the highway in front of us. He’s a retired police officer (also an ardent fan of Ontario wines, who knows a lot more about them than I ever will), but I am certain a little refresher course on highway driving would be of some benefit for all of us (but I can’t say anymore than that as we made a pact: What happens in this truck, stays in this truck). 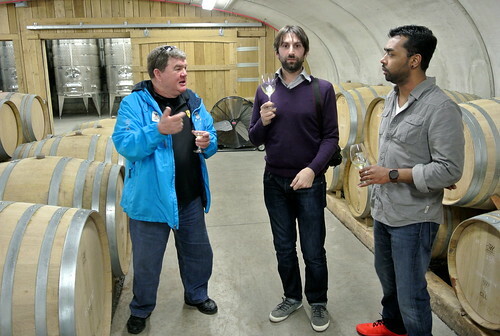 Michael Di Caro, a wine and food writer for Spotlight Toronto, and Suresh Doss, publisher of that food, wine and lifestyle website (photographed above with Rick), are in the back filing stories and tweeting/instamgramming/texting/etc. with wild abandon and seemingly oblivious to the wild gesturing and meandering approach our driver takes. No worries, he’s trained for this sort of thing, right? In all fairness, Bates is the perfect guide. He’s travelled these county roads in PEC so often that his truck is programmed to practically drive itself. I don’t know why he even uses the GPS, because he does the opposite of what it says to do anyway. We have a loosely drawn up plan for two days in PEC, a plan that usually falls apart after the first stop. PEC is not the sort of place that does well with agendas, order and neat little packages. It’s a spontaneous journey; make all the plans you want but it will never work out that way here. People are late, wineries open and close at the whim of whoever is staffing the tasting room (which is usually the owner/winemaker), and you get lost, like a lot (and I’m certainly not blaming Bates here, because he probably gets lost a lot less than I would if I were driving). It is part of the beauty of this pastoral wine destination, the still wild and emerging nature of casual encounters and gorgeous wines in tank, barrel and just-bottled new releases that will be gone by mid-summer. You get what you get on any given day. So, this is Part I of our journey, such as it was, to Prince Edward County, Spring 2014. Cruising into the heart of Prince Edward County, our first stop is according the Bates’ master plan. We are thirsty and the fine bubbles at Hinterland are the perfect cure to quench our thirst. 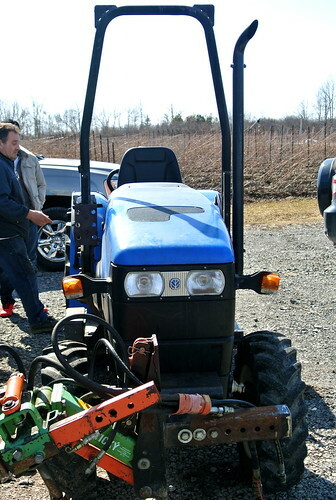 Like so many PEC wineries, the owners of Hinterland are there to greet us. Vicky Samaras and partner Jonas Newman (very top photo) welcome us warmly into the Hinterland tasting room and production facility in Hillier. This is no five-star resort, it’s a working winery with a small space carved out for those who want to taste an array of terroir-driven sparkling wines. Jonas and Samaras planted their vines in 2005 and the objective was always to make consistent quality wines vintage after vintage. But the one consistency about Ontario summers, they quickly found out, is that summers are inconsistent. And, so it is … all fizz, all the time, made with the best varietals matched to the best soil and climate over several different styles from Charmat to traditionally made. It’s what they do and they do it well, quickly building a reputation for sought-after sparkling wines in Ontario. 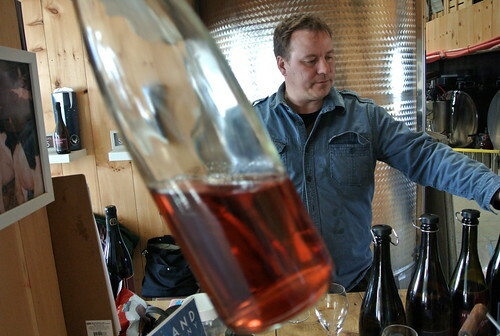 While Hinterland only makes sparkling wines, winemaker Newman does make some non-sparkling wines with sommelier William Predhomme under the North Shore Project banner (Syrah from Lake Erie North Shore) and his own Terra Lemnia wines from the Greek island of Limnos. The white grape, called Muscat of Alexandria, has been grown on the island for over a century. The Limnio thrives on the rugged hard to access terrain of the east side of the island and the muscat is grown on the west side. Newman has coined the phrase “the Valley of the Muscat” which is an area around St. Demetrios where one can see a dramatic valley under the muscat vine. 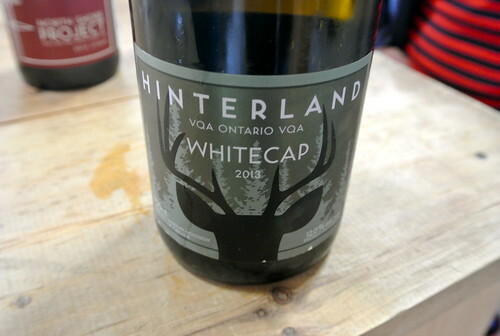 Hinterland Whitecap 2013 ($22, Vintages, winery, 88 points) — This is made in the Charmat style, and blends Vidal, Riesling and Muscat into this easy-to-like, easy-to-drink sparkler that is highly aromatic with peach, citrus, wild summer flowers and apple slices. It’s bright and fresh on the palate with tart lime-citrus, peach and tropical fruits. Hinterland Rose 2011 ($37, winery, 91 points) — This traditionally made sparkling wine is a blend of 85% Pinot Noir and 15% Chardonnay from estate fruit. It is simply delicious and, in my opinion, the signature wine from Hinterland. It starts with a beautiful pale salmon colour and shows a nose of piecrust, strawberry and cherry with a lick of citrus and toast. It is driven by racy acidity on the palate with flavours of wild raspberry, tart cherry and toast all delivered a long and refreshing finish. North Shore Project Syrah Rose 2013 ($22, mid-may release, 90 points) — This is the second Syrah release from this joint project with Toronto sommelier William Predhomme from Syrah sourced at Colio in Lake Erie North Shore. They felt the Syrah in 2013 wasn’t of the quality to warrant a traditional wine so they made a rose from the fruit. This is a delicious rose with a gorgeous nose black cherry, cassis, mature red fruits and a touch of white pepper. It’s made in a bone-dry style and shows vibrant and savoury red fruits and bolstered by fresh acidity. 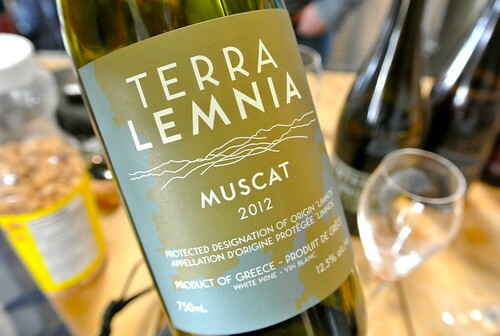 Terra Lemnia Muscat of Alexandria 2012 ($23, get it here sales@hinterlandwine.com , 88 points) — This Muscat of Alexandria is from the Greek island of Limnos in the North Aegean introduced to the island over a century ago. It is made at a co-operative winery on Limnos and is now available in Ontario through private order. This is an extremely rare and dry Muscat from Limnos with an aromatic nose of lemon drop, lanolin, oyster shell, citrus and grapefruit that is, oddly, reminiscent of Hunter Valley Semillon. It is quite delicious on the palate with grapefruit and lemon flavours in a perfectly dry style all bolstered by bright acidity. When Hubbs Creek owner and winemaker John Battista Calvieri says he’s “trying the garagiste approach” to wine making, he’s not joking. As we arrive for a quick tour inside his winery, it is all there in front of us: Tasting room, barrel room, tanks … the whole shebang. It is typical of the Prince Edward County style; high quality wines made in tiny quantities with uncompromising details. It’s not surprising that Calvieri’s most prized piece of equipment is a used (but new-to-him) narrow tractor capable of navigating down the medium- to high-density, tight rows of vines he chooses to plant. He makes us walk around the tractor to admire its compact frame and the zoomy modifications he’s made to his new baby. He is very proud papa. As he is with his small collection of wines, mostly Pinot Gris, Pinot Noir and rose, that started arriving on the scene last year to critical acclaim (and sold out quickly). Hubbs Creek is located on a 500 million-year-old geological formation known as the Lindsay formation from the middle Ordovician period. The soil is stony (limestone fragments) and calcareous by nature. It varies in depths anywhere from 18 to 36 inches and lies on a fragmented limestone bedrock. The soil in which Hubbs is located is locally known as Hillier clay Loam. It has a high lime content that is ideal for growing and making Burgundy style wines. In the spring of 2002, over 3,000 vines of various Pinot Noir Dijon clones were planted. The vineyard spacing for the first planting is 4 feet between the vines and 5.5 feet between the rows. This planting is considered high density. In the spring of 2003, 2,500 more Pinot Noir vines were planted using various clones along with 1,200 Pinot Gris vines. Another 1,200 vines Pinot Gris vines were planted in 2004. 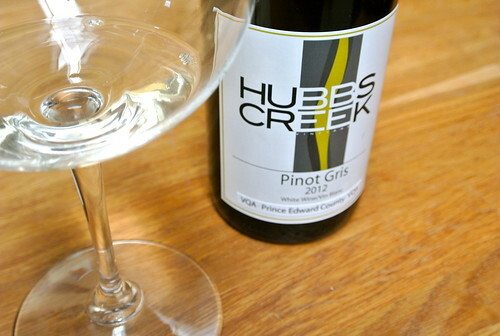 Hubbs Creek Pinot Gris 2012 ($18, 91 points) — I love this style of Gris with its crisp and refreshing nose of green apple, pear and pure river rock minerality. The refreshing tone of this wine carries to the palate with apple-citrus flavours, wet-stone minerality and racy acidity that induces sip after sip. Hubbs Creek Pinot Noir Unfiltered 2011 ($29, 91 points) — A personable, terroir-driven Pinot with aromas of beetroot, cherry, savoury spice, violets and foraged mushrooms. On the palate there is a distinct mineral and floral note through the core with integrated spice, a silky feel, and length through the finish. A stylish, unique Pinot from Hubbs. Keint-he Winery & Vineyards wasn’t on our original agenda for this trip, but knowing that winemaker Ross Wise (above) had recently joined the team, in what has been a bit of a revolving door a the winery in recent years, we decided to pop in and see if we could taste the new releases. The name of the winery is derived from a native word. Keint-he was the name of one of the four Seneca villages in this part of eastern Ontario. 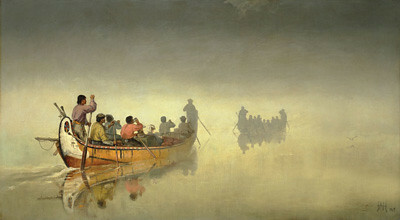 The Senecas were one of the five tribes of the Iroquois. The word Keint-he was later francocized into, Quinte and used in English names such as, the Bay of Quinte. 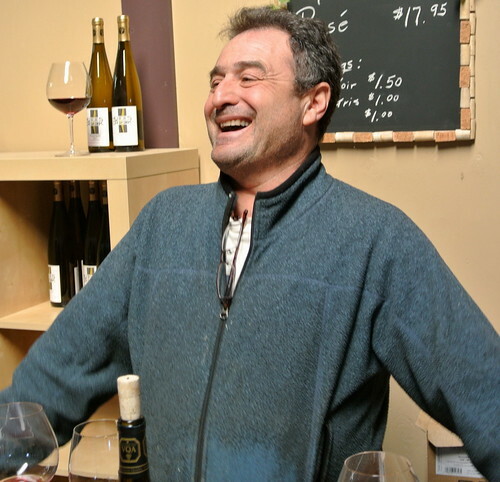 Ross, who splits his time between Keint-he in PEC and several wineries in Niagara (and also a very cool craft beer project), is an accomplished winemaker with a passion for terroir-driven, cool climate wines, and has a special place in his heart for Pinot Noir. With a Bachelor of Viticulture (Charles Stuart University) and an Advanced Diploma in Oenology (Hawkes Bay), Ross has worked with wineries such as Felton Road Winery in New Zealand (internationally famous for their Pinot Noirs), and Grove Mill, in Marlborough, one of the most notable Pinot regions on earth. Keint-he is rooted in the pursuit of making Pinot Noir and Chardonnay that have international character, applying the Burgundian model of viticulture to the County microclimate. 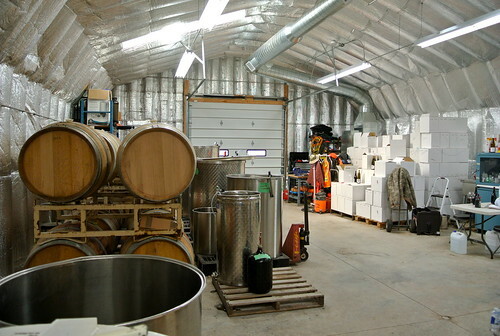 Both Pinot Noir (from PEC and Niagara) and Chardonnay form the basis of the portfolio at Keint-he where 28 acres of estate grapes are under vine. 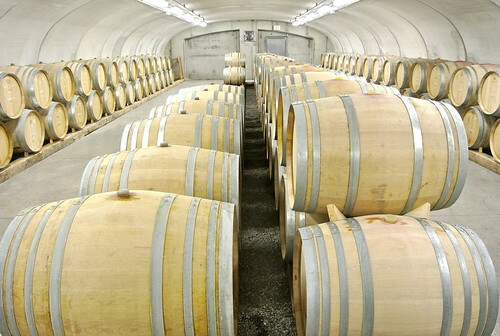 They also produce small amounts of Riesling, Vidal, Pinot Meunier, St. Laurent, Gamay and Syrah. Keint-he Portage Chadonnay 2012 ($20, 88 points) — This is the first Chardonnay produced entirely from PEC-sourced fruit. The nose displays lemon drop, apple slices, citrus, vanilla and subtle minerality. There is a soft texture on the palate without being flabby with citrus and apple flavours bolstered by toasted vanilla and butterscotch undertones. Keint-he Hillier Blanc 2011 ($28, 90 points) — This unique assemblage has returned after a two-year absence. It’s a blend of the white juice of red Pinot Meunier and Chardonnay, and spends12 months in a combination of new and seasoned French oak. It’s highly aromatic with pear, pineapple, vanilla and nutmeg spice. It has lovely texture and oak styling in the mouth to go with pear and lemon flavours that caress the palate. Keint-he Portage Pinot Noir 2012 ($25, 90 points) — Made from a blend of grapes from three estate vineyards — Closson, Benway and Foxtail — with each portion aged separately in French oak for 12 months before the final blend was decided upon. It shows a bright red colour with aromas of beetroot, wild raspberry, savoury spices and cedar notes. It is silky on the palate with cranberry, cherry and integrated spices. Terrific energy in this Pinot with soft tannins, wonderful acidity and length through the finish.